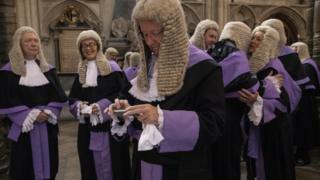 Senior judges in England and Wales could be set for pay rises of up to 32% if recommendations made by the Senior Salaries Review Body are accepted. The move aims to address low morale among judges and to compensate them for changes to their pension scheme. The recommendations would see a High Court judge receive an additional £60,000 a year. Crown Court judges would receive a 22% increase – taking them to £165,00 – and district judges would get an 8% rise. The government says it values the work of what it calls the UK’s world-renowned judiciary, and is considering the recommendations. High Court judges currently earn £181,566 – around £30,000 more than the prime minister’s salary – but that has not stopped a recruitment crisis from developing. The number of high calibre, high earning lawyers applying to the judiciary has halved in the last 10 years. A report last year linked low morale in the judiciary – where one in three judges were considering resigning – to pay, pension changes, and increased workloads. If accepted, the pay rises would be considerably greater than those offered to other public sector workers. Police and prison officers, for example, have been restricted to pay rises of less than 3%. During the summer, the government announced a 2.9% rise for armed forces personnel, a 3.5% rise for teachers and a 2% rise for doctors and dentists.